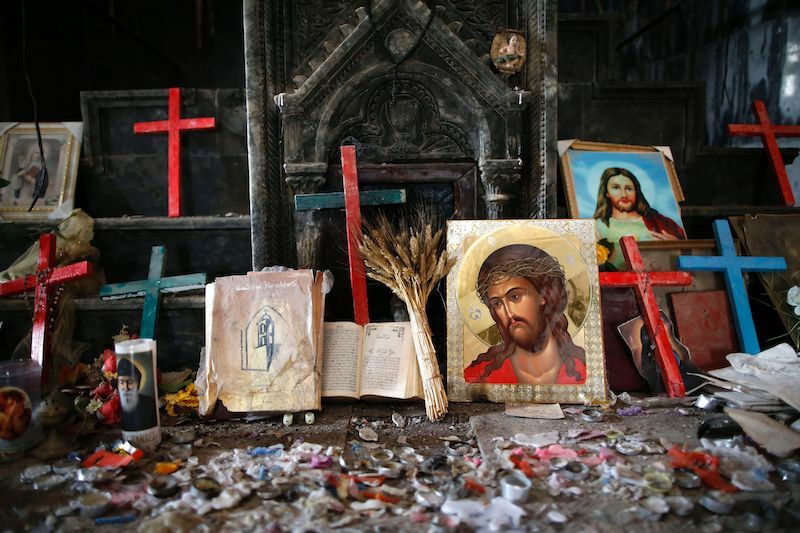 Crucifixes and icons are seen at the heavily damaged Church of the Immaculate Conception in Qaraqosh, some 30 kilometers east of Mosul, on April 2017, as Christians mark the first Palm Sunday event in the town since Iraqi forces recaptured it from Islamic State jihadists. A young mother came shyly to Father Ibrahim, holding a five-month-old baby, who was born at the end of the Islamic State’s occupation. The woman, called Rita Emad Abdulahad al Nisser, was twenty-four, and wore long hair and a ­T-shirt that read: live in paris. love in paris. She offered the infant to the priest, who blessed the baby. Rita was Elham’s daughter-in-law. Her parents worked at a pharmacy in Bartella, a town of fifteen thousand, a dozen miles east of Mosul. In 2014, Rita was in her last year of university studying En­glish literature with “three exams to go” when the Islamic State arrived. As she spoke, her memories of the night the Islamic State fighters arrived grew closer—a phone call at six in the morning from a relative in a nearby village; her father in tears, waking her and her siblings; his grim instructions to pack a small bag. Her hands shook as she spoke.